This is a guest post from JC, who writes about dividend investing on Passive Income Pursuit. JC has been a dividend growth investor since 2011 focusing exclusively on dividend paying stocks for his long term portfolios. Over the last couple weeks I've been writing about how companies grow and why it's so important to see how the growth is coming because not all growth is created equal. Today I wanted to give an example of the differences that can arise if you just look at the numbers as reported instead of digging into them yourself. But first a quick recap. Revenue growth is one of my favorite metrics to look at for a company. I don't have any numbers to back up my claim, but I think you'll all agree that a growing revenue stream leads to rising profits which leads to my personal favorite, a sustainably increasing dividend. It's pretty safe to say that you won't find many companies that have a lengthy dividend growth streak that haven't also grown their revenue. That's why I feel it's so important to monitor the top line and how it's growing. Companies have 4 ways to organically grow the top line and another way to manufacture that growth. The truly excellent companies are able to capitalize on all 4 of these sources and take advantage of opportunities as they come. Whenever you find a company that is able to increase prices while also growing their volumes you ears should perk up. Target Corporation (NYSE:TGT) operates general merchandise stores in the United States and Canada. Target is a dividend champion, which has paid dividends since 1965 and raised them every year for 48 years in a row. The most recent dividend increase was in June 2015, when the Board of Directors approved a 7.70% increase in the quarterly dividend to 56 cents/share. The company's largest competitors include Wal-Mart (NYSE:WMT), Costco (NASDAQ:COST) and Amazon (NASDAQ:AMZN). Over the past decade this dividend growth stock has delivered an annualized total return of 6.30% to its shareholders. Future returns will be dependent on growth in earnings and dividend yields obtained by shareholders. The company has managed to deliver a 6.80% average increase in annual EPS over the past decade. Target is expected to earn $5.28 per share in 2017 and $5.80 per share in 2018. In comparison, the company earned $5.25/share for fiscal year 2016. My retirement strategy is focused on building a dividend portfolio of high quality blue chips, which are reliable dividend payers. For my dividend portfolio, I look for companies which can regularly grow their dividends for years. A long record of dividend increases is an indication of a strong business model that produces reliable earnings, revenues and cash flows. The Clorox Company (CLX) manufactures and markets consumer and professional products worldwide. The company operates through four segments: Cleaning, Household, Lifestyle, and International. The company raised its quarterly dividend by 3.90% to 80 cents/share. This dividend champion has been hiking dividends for 39 years in a row. The ten year dividend growth rate is 10.40%/year. The rate of dividend growth has slowed down considerably since 2013. Currently, the stock is overvalued at 26 times earnings and yields 2.50%. At this stage, I would not be adding to my position in Clorox. The company seems like a decent hold, where dividends are reinvested elsewhere. It would be more interested on dips below $100/share. I am a fairly frugal person. An example of that is the fact that I drive a 15 year old car. I would likely keep driving this car until all is left is the steering wheel. The money I have saved always purchasing second hand cars would result in me being richer by hundreds of thousands of dollars over my lifetime. I do not see the point of buying an expensive new car every five years in order to get from point A to point B, when an older but reliable car can do the same thing for less. This is a guest post from Keith Park, who writes about dividend investing on DivHut. Keith has been a dividend growth investor since 2007 focusing exclusively on dividend paying stocks for his long term portfolios. With dividend growth investing being a very popular method for creating a growing passive income stream for the long haul, many first time investors might feel intimidated by the process of actually building up and creating their own dividend investment portfolio. While I can understand the hesitation and resistance some might feel to wanting to undertake such an endeavor, I can say first hand that the task is not as difficult as some might want you to believe. Creating your own investment portfolio that can provide you an ever increasing dividend income stream need not be difficult if you stick to some basic guidelines and investing principals during all market conditions. These investing traits have carried me through some of the toughest times to hold equities and today I am glad I followed my own set of rules as it has served me well for many, many years. With that being said, let’s dive into my personal method for selecting dividend paying stocks. Back in 2007, when I decided to become a dedicated dividend growth investor, I decided to build the foundation of my portfolio upon the Dividend Aristocrats list. To me, this list entails the ‘best of the best’ in terms of finding excellent long term dividend growth stocks. To make the elite Dividend Aristocrats list, a stock must raise its dividend every year for at least twenty five years. If a company can achieve this feat its a clear sign that management has a shareholder friendly dividend distribution policy as well as the ability to manage cash flow in order to continually raise its dividend year after year. Names that I have considered from this list and are included in my current portfolio are, Archer-Daniels-Midland Company (ADM) with 40 years of dividend raises under its belt, Emerson Electric Co. (EMR) with an impressive 59 year history of raises and 3M Company (MMM) with 57 years of consecutive growth to name a few. Of course, this is not an endorsement of blindingly building a portfolio solely from stocks on this list, rather, it’s a solid starting point for further research to pick and choose from some of the most solid and reliable names in the industry. Oil and gas prices are cyclical in nature. The recent downturn in energy prices that started in 2014 has pushed energy stock prices, earnings and dividends lower. The question on the minds of many investors is what to do with their energy investments. I believe that studying history should provide some perspective on the situation. 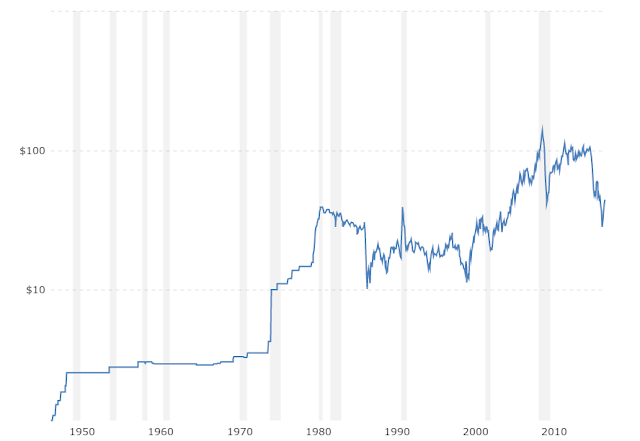 Over the past 60 – 70 years, oil prices have generally moved up. However, this was not a gradual increase each year. It was rather a series of violent moves up and down, in order to confuse the maximum number of participants. For example, in the 1970s, oil prices move up a lot. During the 1980s, oil prices were mostly flat, with the occasional spike and bust ( like in 1986). The 1990s started out strong with the spike around the time of the first gulf war, only to keep sliding all the way down to multi-decade lows achieved in 1998. Commodity producers are price takers - readers who read my analysis of BHP Billiton in 2013 hopefully learned that lesson, and avoided buying this company. There is very limited product differentiation between different types of crude for example, which is not sufficient to warrant a price premium that is immune to downward pressure in oil prices in general. This is a guest contribution from Liquid at Freedom 35 Blog. Liquid is an avid investor in the North American financial markets and blogs about financial independence. I was fortunate enough to start learning about personal finance in my early twenties as I started my career in 2009. The abrupt transition from making no income in college to earning $35,000 a year from my first real job was a pleasantly surprising change of financial pace. It allowed me to move out from my parent’s basement soon after and marked the beginning of my adulthood and independence. But as Ben Parker once said, “with great power comes great responsibility.” Since income is a form of financial power I knew that if I didn’t manage my money well, it could end up costing me big time. So I read some personal finance books and blogs to educate myself on how to save and invest. What I discovered changed my entire perspective about money forever. I use to believe that money was simply a medium of exchange to facilitate economic activity. That’s what they taught us in high school. But now I realize it’s so much more than that. I’ve discovered that money can be associated with a lot of different implications such as power, prestige, security, well being, authority, and respect. When I track my net worth and witness its upward acceleration year after year I feel tremendous potential! When I earn money I contemplate new options and possibilities. When I spend money I see the influence I create on the people around me. And when I invest money I’m insuring the security of my future lifestyle in retirement. Almost all aspects of society is influenced by money in one way or another. So I really feel like the more I learn about money, the more I understand how the entire world works! Out of all the different investment strategies I’ve come across, the most compelling and sustainable one for me has always been dividend growth investing. Dividends come from a company’s earnings, so a consistent pattern of increasing dividends from a stock means the underlying company must have a very competitive business model. Unlike capital appreciation which is just paper money until its realized, dividends paid to shareholders are real, immediate, and readily usable. The empirical evidence that stocks with increasing dividends outperform many that don’t lead me to the conclusion that I had to make dividend growth stocks the primary driver of my retirement plan. The most recent dividend increase was in September 2015, when the Board of Directors approved a 2.70% increase in the quarterly dividend to 56.50 cents/share. The company's competitors include AT&T (NYSE:T), Sprint (NYSE:S) and T-Mobile (NASDAQ:TMUS). Over the past decade this dividend growth stock has delivered an annualized total return of 11.50% to its shareholders. Future returns will be dependent on growth in earnings and initial dividend yields obtained by shareholders. I pick my own dividend paying stocks in my taxable accounts, and wouldn’t have it any other way. I know some of you have mentioned that they have absolutely no time to dedicate to picking stocks. It makes sense – if you are working 60 hours/week, and have a lot of other responsibilities, you might not have any time for picking stocks. I get it. I also know that some do not enjoy the process of developing and following their own plan. So when some readers have historically asked me for the best dividend ETF, I was unable to answer this question. And I was against dividend ETF's in general. This is a guest post by Mike, aka The Dividend Guy. He authors The Dividend Guy Blog since 2010 and manages portfolios at Dividend Stocks Rock. He is a passionate investor. I had the chance to start my investment journey at a relatively young age, I was 22 when I made my first trade on the stock market. Back then, I didn’t have a detailed investment process designed. If there is one thing that I have learned since then is that investing success goes through a solid investment process. If I want to build a strong portfolio, I must have a strong methodology to select the right companies. This is the way to go for any investing strategy, and it is also the case for dividend growth investing. I’ve noticed that not all dividend investors think the same. To my surprise, there are some important differences between most of us in the manner in which companies are selected. For example, I’m definitely not a yield seeker. In fact, if there is one thing I don’t consider during my investment selecting process, it is the dividend yield! I focus on the dividend growth as a pillar of my investing strategy. I’ve established 7 investing principles around dividend growth to manage my portfolio. I wanted to share these principles with you by giving you 8 examples of companies that meet my investing criteria and should create a solid base for any dividend growth portfolio.